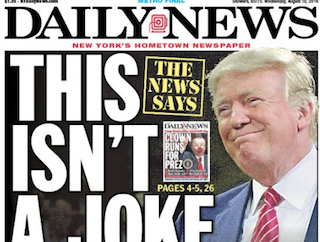 The editors at The New York Daily News have joined every other person with a functioning brain in calling for Donald Trump to abandon his presidential campaign. In an editorial, the Daily News said Trump’s suggestion that one of his gun-owning supporters should murder Hillary Clinton was the straw that broke the camel’s back. Not the time Trump said Mexican immigrants were rapists and criminals. Not the time Trump criticized POWs. Not the time Trump asked Russia to hack the U.S. government. Not the time Trump mocked a disabled person. Not the time Trump denounced the parents of a dead soldier. Not the, well, you get the point. Wouldn’t it be great if this editorial actually worked? Sigh.